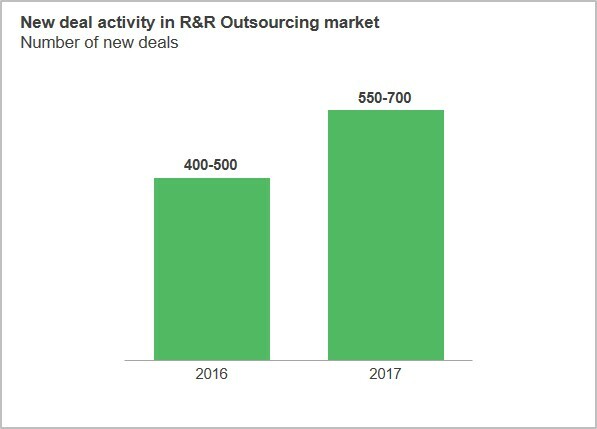 The Rewards and Recognition (R&R) outsourcing market has emerged as one of the fastest growing markets in the HRO space, clocking a growth rate of ~14% between 2016-2017. With employee engagement and experience becoming increasingly important to enterprises, the market is witnessing an increasing demand for R&R services from buyers of all sizes. This demand is bolstered by emerging market challenges such as changing workforce demographics and a rapidly evolving technology landscape. The market is dominated by specialist R&R providers who are now trying to expand their role from “just R&R program administrators” to strategic partners who can provide a gamut of services including consultative support (designing effective R&R programs), access to advanced technology solutions (such as advanced analytics, AI-based chatbots, & decision support tools), and employee wellness & performance management services. With rapid growth of the R&R outsourcing industry, the competition too has intensified. Service providers are making aggressive investments to expand their offerings portfolio and regional presence, leveraging both organic and inorganic approaches.